I finally cast on for a new knitting project, yay! It’s nothing flash or fancy, just a basic ribbed scarf. 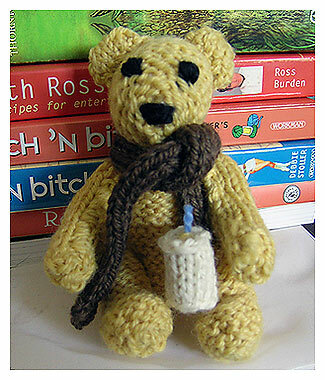 I was faffing around on Ravelry, through my knitting books and magazines trying to decide on a pattern. I had my usual thought pattern of “I can’t knit that! Too complex for me!”. In the end I just picked some yarn and decided to do a basic scarf to get myself back in the habit of knitting. 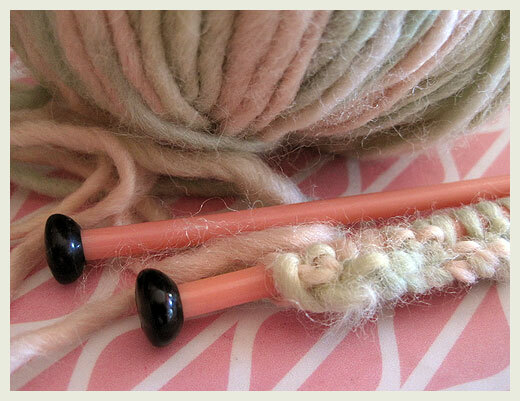 I’m using some Moda Vera Harmony yarn (pink & green) and some of my vintage knitting needles. Pink, of course. Still have the flu and am now up to the coughing stage. Felt terrible this morning but feel a bit brighter after taking some nurofen. Hence the casting on and blogging about it. I found some photos of my older finished knitted projects and thought I’d post a few here. 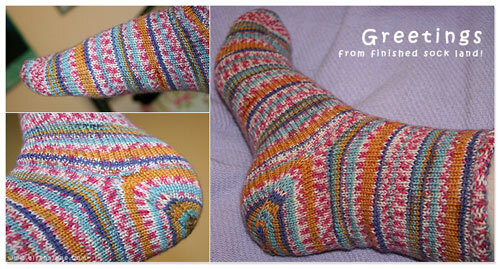 ‘Sister Socks’ a pattern from Yarn Magazine, Issue 3, June 2006. 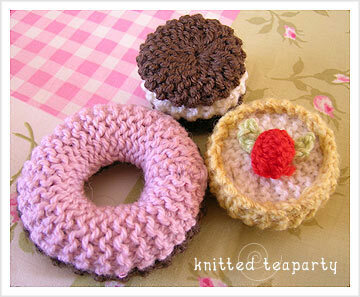 Knitted cakes from Jean Greenhowe’s ‘Jiffy Knits‘. Another Jean Greenhowe pattern, this from her ‘Toy Collection‘ booklet.